Pete is a third generation Steering Specialist, Mechanical Engineer (B.S. from Penn State University), former Indycar Mechanic (3 yrs. with Arciero Wells/Robbie Gordon, Max Papis) and sprint car driver. As President of GME Mfg., he provides direction to an all-star staff with a focus on product quality, design, testing, customer service and continually working on new performance steering innovation. Butch is a second generation Steering Specialist with over 25 years of experience & oversees daily business operations. He handles Customer Sales and Service. He has over 30 years of Dirt Modified and Sprint Car racing and race team ownership experience. As one of the top performance steering builders & rebuilders in the nation, GME Mfg. builds, rebuilds and repairs all types and brands of steering system gears, pumps & racks. 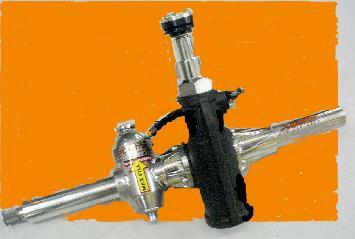 We can build any steering combination that you need. Our easy checklist ordering system gives you the variation that suits your driver/race car. GME Mfg. has the highest commitment to excellence in the performance steering industry. Our products are made only with the finest materials. Our service goes the extra mile to assure quality, reliability & convenience for your team. GME Mfg. 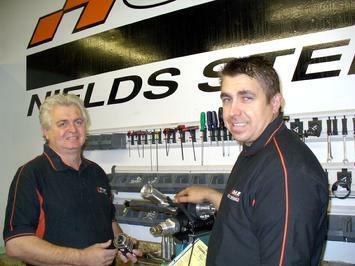 has over 50 years of combined steering manufacturing & rebuilding experience. GME Mfg has over 30 years of combined experience in Indy Car Racing, Dirt Modified & Sprint Car Racing. We know from our racing experience what professional drivers expect out of their steering systems, and we surpass those expectations. The finest raw materials, best manufacturing processes, relentless R&D program & hours of rigorous testing are poured into GME Mfg. 's products. Proper rebuilding procedures & innovative testing equipment such as, magna flux, zyglo & our state-of-the-art Steering Dyno allow GME Mfg. to take the extra steps necessary to ensure that each rebuild will perform & feel just like new. As GME Mfg. expands into different motorsport markets, the focus will always remain the same...provide quality products, innovative & reliable customer service. GME Mfg. 's technological advantages are derived from a background in mechanical engineering, steering inovation, machining processes and testing equipment. GME Mfg. has quite an advantage in repeatability. Nearly every driver has a "favorite steering" they prefer to use. It is true, in the past, it was nearly impossible for steering gear builders to build 2 steerings with identical feel...until now. The GME Mfg. Steering Dyno has cured this "favorite steering" syndrome. We have designed & developed a Steering Dyno that simulates on-track conditions, measures, quanitifies & maps crucial input & output data. We can then analyze the data to properly clone your driver's "favorite steering". This will show immediate results for your team. Increased steering consistency equals increased driver consistency. CALL US FOR YOUR STEERING NEEDS !! !